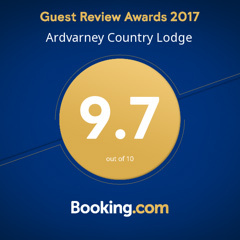 Ardvarney Country Lodge is a lovingly and purposefully renovated country farmhouse nestled in the idyllic setting of Ardvarney, Co. Leitrim. Located slightly inland from the coastal town of Sligo, the Lodge offers three unique accommodation options catering to your individual needs. Our rooms all have en-suite bathrooms and Wi-Fi connectivity, and each one boasts stunning views of the Lodge’s gardens, farmland, and nearby mountains. The Lodge is a stone’s throw away from beautiful lakes, rivers, forests, and historic sites. We have excellent dining facilities on 5 minutes from the B&B and there are a number of nearby towns and villages should you choose to eat and drink elsewhere. The surrounding area is tranquil and picturesque, and there are a multitude of activities to please nature lovers, explorers, and those seeking a taste of Irish country life. Our aim is to make you feel at home, while experiencing everything that Leitrim and its surrounding areas have to offer. We do everything we can to provide you with a warm, welcoming stay, and we offer advice and recommendations for various things to do and see. We offer tailored itinerary packages which can be pre-booked on request via our online booking section. We do charge for tailored packages, but they include attractions and activities that locals themselves frequent, and which you might not otherwise discover. Please note that the entrance/participation costs of any paid activities will be settled with the providers themselves. Ireland’s climate is influenced by the Atlantic Ocean and is relatively mild, which makes it a great place to visit all year round. Ardvarney Country Lodge enjoys a mixture of sunshine and rain, which gives the local scenery a variety of appearances, each of which is just as stunning as the other. The average temperature in winter is about 8°C, while summers average around 18-20°C. When packing, we recommend some light rain gear and a warm jumper for the evenings. Head to the coast, which is part of the Wild Atlantic Wayand visit Rosses Point and Strandhill, to watch the surfers catch waves out in the Atlantic Ocean. If you’re feeling adventurous, take a lesson and experience it for yourself! Not sure where to start? Let us know what you’re in the mood for, and we can point you in the right direction. Close by in Dromahair there are four great pubs; The Blue Devon, the Stanford Village Inn, The Wood inn and the Clubhouse. All are great for having a drink in a friendly setting, with a lovely local atmosphere and live music on occasion. There are two restaurants in Dromahair; Riverbank Restaurant and Luna Restaurant. Riverbank has a great menu and the service is excellent, and while Luna is mentioned in the Michelin Guide, we’d happily dine in either of the two. Slightly further out, in Manorhamilton and Sligo, there’s a broader range of options, so feel free to ask us for recommendations. While we offer pre-book packages designed to show you a range of sights in the area during your stay, we also make recommendations for those opting to follow their own path. Explore the rolling farmland that surrounds Benbulben Mountain and the renowned Knocknarea mountain, home to the legendary Queen Maeve’s tomb. Visit Glencar Valley and marvel at its famous waterfall, or take a trip around Lough Gill, Lough Allen, or one of the many others in the area.